When I first started this website, I didn’t know the first thing about having a successful blog. I never even read blogs before I launched Mint Notion, but I wanted a creative outlet to share my personal finance and travel tips with everyone. I used to think that you could just start a blog and readers would magically find you through social media or Google search results – true story – but boy was I wrong! My blog strategy consisted of 80% content and 20% promotion. I didn’t really focus on establishing a niche since I was trying to create content for everyone. But writing posts for “everyone” made it really difficult to increase my blog traffic. Once I started implementing the right strategies, my blog traffic went from 16,000 to over 100,000 monthly page views! These results didn’t happen overnight and it does take a genuine effort to grow your blog traffic, but if you work smarter (instead of just harder), you too can achieve these results. If you’re serious about increasing your blog traffic, you need to start treating your blog like a business. This is by far the most important step for growing your blog readership because it’s the road map for turning your dreams into reality. Instead of just wishing to increase your blog traffic, break down that goal into actionable steps so you can put your dream into motion. I know it sounds silly, but I highly recommend writing down your goal and the necessary steps to reach your goal. Studies have shown that writing down your goals actually increases the odds of achieving them. Pretty cool right? So open up your notebook or create a Google Docs file and start writing down your goals for your blog. When I first started blogging, I knew that I wanted it to monetize it someday, but I didn’t write down any goals or actionable steps to help me achieve my dream. And you know what happened? A whole lot of nothing. Even though I was adding new posts on Mint Notion each week, I barely saw any growth in my readership and I wasn’t implementing any strategies to monetize my blog. I was frustrated and sad, and didn’t know if I should continue blogging anymore because it was a lot work for very little return. It wasn’t until this past March that I decided to sit down and make a serious plan for the future of my blog and how I was going to start treating it like a business. This is where you determine your blog’s purpose and why your blog exists. Blogging is not a “get rich quick” thing and it does involve a genuine effort if you’re looking to increase your blog traffic and income. I recommend creating a blog post calendar at least one month in advance. This is my #1 tip for maintaining blog post consistency. You can even batch your blog posts together by blocking off a few evenings (or weekend) and writing all your blog posts for the upcoming month. This is about working smarter, not harder. Promoting your blog on social media can sometimes feel like a full-time job. However, there are many tools available to help you schedule your social media posts in advance, which will save you tons of valuable time! I recommend using Hootsuite (for Facebook and Twitter) and Tailwind (for Pinterest). You can get a free trial of Tailwind through my link! Just a few years ago, I started this blog as a hobby while I was in graduate school. I had no idea that blogs could even make money. It wasn’t until I learned how to monetize my passion that I was able to grow my blog readership and income. While you could use the trial and error approach and attempt to learn everything on your own, your blog will generate income faster when you invest in the right blogging education. It took me a LONG time to learn this, which means I was leaving money on the table. Once I purchased my first blogging-related course to learn more about how to make money blogging, I was able to take my blog to the next level. The course teacher makes $50,000 per month from her blog, so I knew that I would be learning from the best! She even earned $300,000 from ONE blog post and will show you how to do it too. It goes without saying that if you want others to take your blog seriously, you also need to take your blog seriously. I always recommend going self-hosted, even to new bloggers, because it instantly gives your blog more credibility. Plus, having a personalized domain name (www.yourblogname.com) looks more professional than www.yourblogname.wordpress.com or www.yourblogname.blogspot.com. I know a lot of new bloggers worry about the cost investing in a self-hosted website and prefer to go the free route, but there are lots of limitations with free blogging platforms. A self-hosted site doesn’t have to be expensive and you can easily start one for just $2.95/ per month. (That’s the price of a fancy coffee drink). I made enough money to cover my hosting fees within the first few months of starting my self-hosted site. You can use my easy step-by-step guide to start your self-hosted blog, which also includes a coupon for a FREE domain name. My hosting plan allows me to create custom email addresses for free. When people want to contact me, they can reach me at [email protected] which looks a lot more professional than [email protected]. First impressions are important and you want to make sure that your blog design communicates the right message to your ideal reader. What first impression do you want to give first-time visitors to your blog? It wasn’t until I started treating my blog as a business that I decided to invest in a beautiful blog theme for Mint Notion. Not only did my new blog theme help increase my blog traffic, but it gave my readers a better user experience too. I recommend Genesis and Pretty Darn Cute Design. I currently use the Pretty Chic theme for my blog and absolutely love it! Sure you can start a blog, write a bunch of articles and post them on social media, but if you want stand out and get people to pay attention, you need to create a cohesive brand for your blog. Your brand is the personality of your blog. Creating a consistent brand for yourself makes you look professional, builds trust with your readers and becomes recognizable (even when your logo isn’t present). If you’re interested in starting your own blog, I created a free 5-day email course to help you start a blog and learn how to make it successful. Join today! I noticed a big increase in my blog traffic after I started focusing on creating longer posts. Not only are longer blog posts better for SEO, but your readers will love it too! Your readers want details, they are not looking for quick suggestions or fluff content. When your content is useful and provides practical information, your readers will trust your expertise (in your blog’s niche) and will want to share your articles with their friends. And word of mouth is one of the best forms of advertisement. As Seth Godin said in his book Purple Cow, focus on the “sneezers”, make it remarkable enough for them to pay attention, and make it easy for them to spread. I remember reading an article last year about “how to increase your blog traffic” and the author recommended posting new blog content 5 days a week. I tried this method, in hopes to grow my own readership, but my blog content took a turn for the worst. Pumping out 5 new posts a week didn’t give me enough time to create the quality content that I wanted my blog to represent. This was also during a time when I was still experimenting with different niches for Mint Notion. Needless to say, writing 5 new posts a week didn’t achieve the results that I wanted. I cringe when I look back on my 300-word blog posts and thought they were good enough for my readers. Writing just “good enough” blog posts was not what I wanted Mint Notion to represent, my readers deserved better and more quality content. Instead I honed in on a niche that I was passionate about and wrote longer blog posts (1,000-3,000 words in length). I also stopped writing new articles 3-5 times a week and now only publish 1 new post per week (or less). By creating longer content and posting less frequently, I have been able to devote more time to promoting my content, which has led to a huge increase in my blog traffic. Again, it’s about working smarter, not harder. SEO (search engine optimization) is the process of optimizing your content to gain traffic from search engines (such as Google, Yahoo or Bing). I know that a lot of new bloggers (and even some experienced bloggers) are not comfortable with discussing SEO strategies. In fact, I didn’t even start learning about SEO until two years after I started my blog. However, once I began to learn how to better optimize my site, I noticed that my organic traffic nearly doubled within a few months. My organic stats for August 2016 were over 9,000, so it keeps increasing! Free blogging platforms don’t do any favors for all your SEO efforts. You need to get your own domain and hosting. Many people believe that if you’re serious about your website, you will go self-hosted, and Google gives priority to websites that it deems as trustworthy. You can use my step-by-step tutorial to start your self-hosted blog. (My link includes a special discount for my readers and a FREE domain name). I don’t like having a ton of plugins on my site, but I cannot imagine blogging without using the Yoast SEO plugin. It’s a free tool to ensure that your whole website is search engine optimized. I’ve already talked about the importance of having a well-designed theme for your brand, but it’s also important to make sure that your theme is SEO optimized. It took me two years to invest in a paid theme, but having a SEO optimized theme has nearly double the traffic I received from search engines. I currently use a paid theme from Studiopress and I truly believe they are the best themes for SEO. Before you upload an image to your post, make sure to give your image a title and alt text. Uploading an image with the title “photo-0395c0d” is not good for SEO. I like to insert the title of my blog post in the alt text section, since this is the information that Pinterest will pull when sharing your content. I’ll admit that I didn’t even know these headings existed in WordPress until a few months ago. Headings are not just a nice way to break up your blog content, they are necessary for telling search engines what your content is about. I usually use H2 to break up my content into sub-sections and H3 tags for further sub-sections (if necessary). Almost 90% of my traffic comes from Pinterest, which is why I wrote a juicy post about the strategies I used to increase my Pinterest audience. This social media platform works as a search engine, which is an amazing tool for bloggers. Are we friends on Pinterest yet? If you’ve been struggling to grow your blog traffic, I highly recommend taking the time to read through my post and learning more about the benefits of using Pinterest. To save time, you can use Tailwind to schedule your pins. Click the link to start a free trial! Once you start implementing these blog growth strategies, you’ll also want to make it super EASY for visitors to share your content. I almost never share posts without easy to find share buttons, and your readers don’t have time to search around for your share buttons either. I used to have the SumoMe and Genesis Simple Share social buttons on my blog, but I just recently downloaded the Social Warfare plugin, which has been a total game-changer. When I was using SumoMe, I noticed that people were sharing random images from my sidebar on Pinterest, which didn’t help attract new visitors to my blog. However, Social Warfare allows me to choose the specific image that I want people to share on Pinterest, Facebook and Twitter, along with a pre-written description. Click to share this post on Pinterest to see the hidden image! You can do this without a plugin by adding a hidden image in your post, but Social Pug makes it super easy to optimize my social shares. It also includes a ton of other great features like “Click to Tweet” and analytics, plus I think the share buttons look pretty and fit my brand. This is something that I struggled with when I first started blogging: I read a few articles on how to start a successful blog, tried to the implement some of the suggested strategies, and kept it up even though I wasn’t seeing my desired results. I didn’t even have Google Analytics installed correctly, so I was in the dark about understanding where my traffic was coming from and which strategies were working for me (and which ones I needed to ditch). Multi-tasking was counter-productive and trying to do everything at once didn’t accomplish anything. I used to comment on a lot of blogs (both in my niche and outside of my niche). I really enjoyed reading other people’s posts and it felt good to support other bloggers by leaving them a thoughtful comment. It also felt great when some of these bloggers took the time to visit my blog and reciprocate. However, even though I was receiving around 50-100 comments per blog posts, my monthly page views were sitting around at 16,000 and I didn’t understand why my blog readership wasn’t growing. It was also very time consuming to comment on lots of blogs, and the results weren’t worth the effort. So I shifted gears this past spring, and started focusing on different strategies to promote my blog. By using these new strategies, which I’ve shared in this post, I have been able to grow my monthly page views from 16,000 to over 100,000 in just a few months! It’s pretty amazing and I still can’t believe how a simple change in mindset could achieve these results. My blog readership has increased, my blog income has increased and I’m excited to continue improving and growing my blog. Did I miss something on this list? 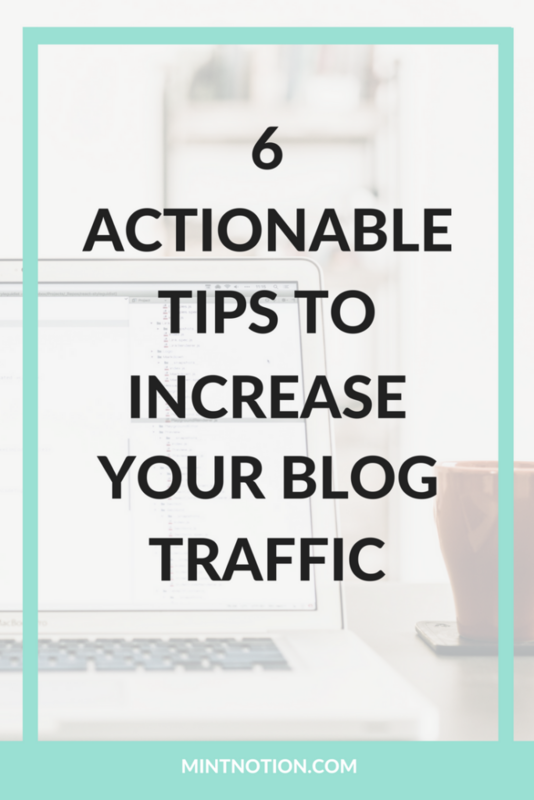 What are your favorite ways to increase your blog traffic? Thank you so much Eden – this post has really got me excited to grow my blog. I’ve only just started it and am looking for ways to increase traffic. Pintrest has been a very effective tool so far. Question for you – how many PVs would you need in order to begin with affiliate marketing? Thanks for reading Ela! Pinterest is definitely worth using to promote your blog. I like using Tailwind and Boardbooster to schedule most of my pins. It saves me a lot of time. It’s fantastic to hear that! Blogging can be really difficult to manage and it’s great to hear the big wins from the other bloggers that I follow along with. I’m trying to reevaluate my strategies so this post couldn’t have come at a better time for me. When I saw the title of this post…. I was so excited. That Pinterest tip post was so helpful, so I knew this would be a good read! Very insightful read. And I should totally say congrats to you because your blog is becoming more and more successful and that’s amazing! I love and needed this! My readership has definitely hit a plateau, great post! Eden, this was seriously such a fantastic post. It makes me happy because I feel like I’ve already implemented a lot of these in the last few months (been blogging for almost 8 months). I could still work on a few things, but I have to say number two is the biggest YES. I completely agree. I feel like you’ll find a lot of bad advice online when it comes to posting frequency. I’ve seen some blogs have very short editorials and it completely works for them. For me it wasn’t working and I now only post twice a week and it has been a game changer. I write 1,000 – 3,000 words as well. I love it! And you’re right, it gives you more time to promote and your stories stay alive longer. I mean, who wouldn’t want that when I spend three hours writing it?? 🙂 GREAT POST! These are great tips. I have a lot of work to do for my blog!! I think the editorial calendar is something I should prioritise. I also never really considered Pinterest to be a way to bring in more readers. I’ll have to give that a go. I’m still trying to work out my google analytics. It can be pretty confusing at first, I don’t even know if it’s right ha! I’m hoping I can look back on this stage I’m in one day and have a bit of a laugh. Thanks for sharing! This is super helpful! I totally agree on the one to ditch what isn’t working. There have been things that weren’t working on my blog for so long but I kept doing them because I thought they were the best strategy. I’m going to sit down today and try to implement some of your tups! Great tips! And impressive growth! I especially like the tip to “Ditch the strategies that are not showing your desired results”. It’s so easy to keep doing the same thing over and over without taking the time to step back and actually think about it! Tell me about it! I focused on the same strategies for far too long (thinking that’s what I was supposed to do), but now I focus on what’s actually working and ditch the ones that don’t work. Thanks for reading Emily! This is JUST what I needed to read today!! I work a full-time job and balance my blog at the same time and many many days it seems so overwhelming! !I love the idea of writing my goals out, they are in my head, but creating a list with those actionable items will really help me to visualize why I do what I do! <3 Thanks for sharing, I'm bookmarking to reference back to!